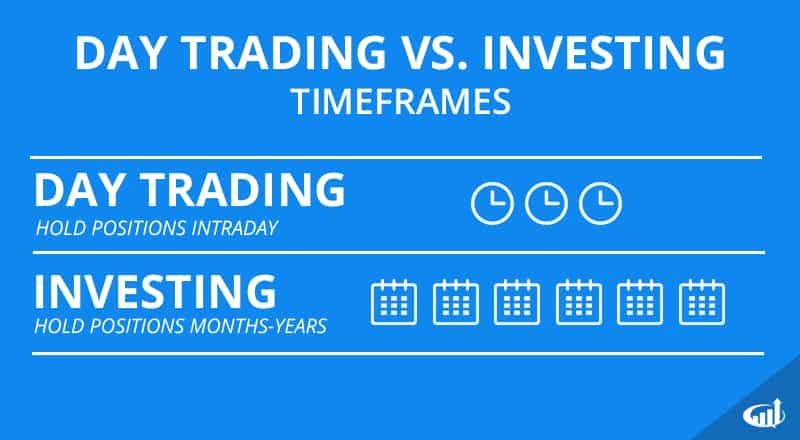 The main differences between day trading and investing are the activity levels and position holding times. Day trading involves active management with a short-term holding period, whereas investing involves passive management with a longer-term holding time horizon usually spanning from multiple quarters to years. Day traders focus on short-term trades contained in a single trading day utilizing direct-access trading platforms. Investors tend to monitor portfolio positions periodically from weekly to quarterly through statements and online browser based platforms. Day trading relies more on technical analysis utilizing charts and technical indicators. Investing focuses more on fundamental analysis including earnings reports, news, financial metrics and ratios. 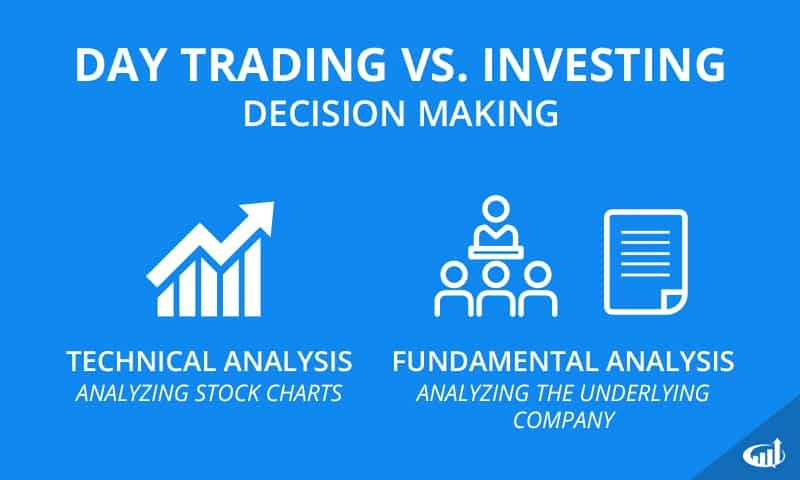 Basically, day traders are more interested in a stock's price action, whereas investors are more focused on the underlying company. Day traders may also utilize leverage for a higher concentration of shares to pocket a smaller relative price movement price gain. Day trading involves more transactions thereby generating more commission costs, whereas investing involves very few trades. A day trader may get in and out of a position multiple times in a single day, whereas investors may hold positions for months or years. Because of this, day traders are more sensitive to broker commissions. To an investors who plans to hold a position for years, a commission is insignificant. Contrarily, day traders are getting in and out of positions regularly so commissions can add up fast. Day traders have different criteria than investors when looking for stocks. As mentioned above, day traders are more focused on technical analysis than fundamental analysis. Traders are not too concerned with a companies long-term potential, management team, etc. Instead they are focused solely on price action. Day traders look for stocks with momentum and volatility. This creates the opportunity to take advantage of significant price action. It also provides the liquidity necessary to get in and out of positions. Contrarily, investors are focused on good companies: companies they believe will grow in the coming years. Whereas volatility is beneficial to a day trader, it could represent instability to an investor. Investors tend to look for safer stocks from more legitimate companies. Downside risk can form from international markets and events while U.S. stock markets are closed resulting in futures gapping down, which ultimately causes most stocks to also open with a gap down. Investing believes these are just small hiccups in the overall picture of the long-term perspective. Some of the most volatile holdings periods involve earnings reports. Long-term investors take on the greatest risk during the earnings season. Public companies are required to provide a quarterly earnings report detailing the state of business and the prior quarters performance. Most companies will also provide performance projections moving forward, also known as earnings guidance. Stock’s can react violently to the corporate earnings report and guidance. Years of profits can be lost in a single session for missing consensus analyst estimates and guidance figures. Investors typically will decide whether to continue holding a position based on these results where fundamental analysis plays a key part in the decision-making process. Day traders analyze short-term price action whereas investors analyze longer term trends.